By the 1860s the mother lode of gold had been picked clean. Those who had struck it rich settled San Francisco alongside those who hadn't. A civilizing calm, that came with SF's growing economic and social stability, enticed an increasing number of women to venture West. Though it's likely that there were other women photographers during the 1850s, the second documented was Mrs. A.M. Genung, a veteran Stockton daguerreotypist who arrived in 1860. Her daguerreian gallery operated at the corner of Clay and Kearney until 1861 when, according to her great grandson, she traveled to China on a photographic gig from the British government. Probably an important reason why women were able to pursue photography in the early years was the lack of established academies, like those for science, sculpture, or painting, that could deny them admittance. Many women worked in family businesses and learned the photographic process from their husband or father (and often continued on alone after his death). In an era when there were very few women business owners, photography studios were one of the businesses that women owned and operated. A total of 6 female photographers are known to have worked in San Francisco during the 1860s, all of them married except for one. Quite a few of the early pioneer women had photography careers that spanned decades. Carolina Klain began her 24-year photography career in landscapes and portraiture working with her husband, a traveling landscape photographer named Nathan Klain, in 1867. They operated the business out of their home on Natoma St. until his death in 1885. Carolina continued operating the gallery from her new home on McAllister, specializing in landscape views, until joining up with her son in 1891 to operate the Klain & Klain gallery. Of particular note is Mary Anna Clifton Godeus, a San Francisco photographer, whose career began in 1866 and spanned 35 years. At 16 years old she was married. At 17 she was operating the South Park Photographic Gallery on Third St. with her husband John D. Godeus. They operated several galleries together until 1879. Godeus family lore suggests John then photographed prisoners for mugbooks at San Quentin Prison. By 1890 the Godeuses were again operating a studio together until John's death in 1895. (Godeus street was named in honor). Mary took over with her daughter Mary Clara, also a photographer, continuing to operate the Godeus Art Studio on Sixth Street until at least 1901. There are over 60 surviving images from the Godeus studios. Women photographers unencumbered with a spouse were considered particularly daring and brazen. The first such unattached photographer, Anna McGinn, operated and owned several photographic galleries from 1863 until 1867. For unknown reasons, in 1870 she suddenly made a radical career change and worked for the next 30 years as an embroidery stamper. By now, several advancements had been made in photographic technique. Ambrotypes were photos made in San Francisco around the late 1860s. They look similar to daguerreotypes with their sharp detail, but ambroytpes decreased exposure time down to a few seconds and were printed directly on glass instead of metal. The resulting glass image was a negative, but by placing dark paper or velvet behind the glass, the photographer was able to produce the appearance of a positive image. Although ambrotypes simplified the photographic process it was still messy, smelly and cumbersome. In the early days, photographers could be recognized by their blackened fingers caused by the use of silver nitrate It was popularly described as the "black art." The most influential advancement in the late 1800s was the development of negative to positive photography -- printing with a glass negative onto paper. It was this new efficient photographic process that led to employment for a great many women in a wide range of social classes. However, for middle-class women who needed or wanted to work there were very few acceptable occupations available beside teaching or nursing. The impact of photography on women's economic situation is most apparent during the 1870s when the photographic industry unfolded with the mechanization and mass production of paper photographs. Advancements in camera technology enabled a photographer to print an unlimited amount of photographs from a single negative. The technical problems of early wet-plate photography gave way to the assembly-line needs for the mass production of photographic calling cards or carte de visites. These enormously popular and cheap paper photographs led to employment for many women in related photographic trades such as photo colorists, retouchers and photo mounters. Furthermore, social critics argued that suitable occupations with higher wages needed to be created for adventurous women, so they wouldn't find themselves sliding down the slippery slope into a life of vice. One newspaper studied the wages and costs of life for women in San Francisco. "Wages of girls are from $3-$12 a week. Very few earn $12. The average is about $9. Ballet girls get $10 a week. Some are paid exceptional prices, as the forewomen in large dressmaking establishments, who sometimes make $18 to $20 a week, and the first class colorers of photographs who get from $20 to $25." (Daily Evening Post, August 29, 1872) The paper also noted it cost women "from $5 to $6 a week for board and lodging and 50-75 cents for washing." It became acceptable and even desirable for women to work in the photographic industry and women flooded the trade. By 1870 the general population had tripled from the previous 10 years -- almost 150,000 people now called San Francisco home. During this decade 15 women photographers and almost twice that many worked in the related trades, yet many more undoubtedly worked in the photographic industry without any record of their activities. By the 1890s, however, there were 141 documented women working, not as photographers, but in the photographic industry. Women were often called upon for piece-work jobs in the mass production of celebrity or special event paper photographs. Stereographs of the Modoc Indian War photographed by Carleton E. Watkins were mass-produced and "finished in good style at Watkins' establishment on Montgomery Street, San Francisco, 20 women and a number of Chinamen being kept constantly at work," according to a June 25, 1873 report in the Yreka Journal. "Really I cannot see the slightest objection to her going to the head of the business [of Bradley & Rulofson]... you will find her quick eye and keen perception -- of great -- indeed incalculable value to your business -- and I think, moreover, the influence of her presence will be very beneficial." Women often took to the road, expanding their business to rural areas. At 28-years-old, Emma Gills Smith was widowed, had two young children and was earning a living as a San Francisco photographer selling enlarged pictures, colored in India Ink, crayon and water colors. The Yreka newspaper noted her arrival in July of 1876: "Her trip to Northern California was for the purpose of visiting relatives here, and also to introduce her superior style of pictures, which all who take the pains to examine, and desire a good picture of their friends or selves, will certainly obtain one of her style in preference to the perishable common photographs, which soon fade and look dead." The popularity of these colored, non-dead looking paper photographs employed hundreds of women in studios throughout San Francisco. By the 1880s, innovations in camera technology led to massive new changes in photography and an explosive surge in amateur photography. The process was enormously simplified with dry plates and smaller cameras: instead of coating their own negatives, photographers could now buy boxes of pre-sensitized plates. A pivotal event in 1888 was the introduction of the lightweight, manageable Kodak camera. Focus and exposure time on this camera was pre-determined, and darkroom space was unnecessary since the film and paper could be sent in for developing. The new, simplified process encouraged many well-to-do ladies and gentleman to experiment with photography as a hobby. The new photographic equipment was also cheap. For a reasonably small investment (about $10 or a week's wage for a ballet girl) women could purchase a small camera, tripod, lens, plates, and enough chemicals to start a business. As photography became more popular and accessible, photography clubs formed and experimentation flourished. Although 50 years earlier photography was initially viewed as a substitute for drawing, by now it was often seen as a separate art form: a new channel of expression. The California Camera Club was founded in San Francisco in 1890 and soon found a growing number of women in its ranks. With the new portable cameras many women were able to explore and photograph rural areas without the need of a darkroom. Entirely on her own, San Francisco photographer Mary Winslow traveled and photographed Yosemite and rural California towns, bringing back landscape photographs to sell. On her very first three week adventure Mary brought home enough orders to earn $125. If business was good she stayed in towns for four or five weeks, and at night if she was traveling between towns she camped in her buggy. Although this is how she made her living for at least three years, there is not a listing for her under photographers in any business directory. In the mid-1890s, the soaring popularity of amateur photography coincided exactly with the new-found craze of bicycling -- the two endeavors melded together perfectly. There were camera club cyclists and cycling club photographers. Groups of photographers rode out of town on their safety cycles with their hand cameras to photograph the great outdoors. In 1897, one amateur photographer, Rose Cantwell, was a member and 1st Vice President of the Camera Club Cyclists. Across the country there were emotionally charged debates about women's places in cycling and in photography clubs. But in many photo-journals (like American Amateur Photographer) and outing magazines, both pastimes were commended as healthy pastimes for women. In the fading Victorian era, both bicycling and photography contributed a great deal to women's independence and both were emblematic of the major changes taking place in women's lives. "The studio everywhere shows evidences of a woman's hand and is undoubtedly one of the most artistic in the city... Mrs. Schulze, who gained a well-earned reputation several years ago for her Chinese photos, has probably the largest collection of pictures of Chinese children in the United States, and the demand for them has become so great that the studio was an absolute necessity... everyone is familiar with the pictures, and as they form the best possible souvenir of California, the demand has always exceeded the supply. This year Mrs. Schulze decided to mount some of the pictures on calendars. The result so far exceeded her anticipation's that she has decided to start at once and begin the manufacture of a supply for 1902." While many of these photographers were extraordinary, accomplished women, there were also quite a few slightly bizarre, not-so-successful but just plain intriguing female photographers. In the 1890s, for example, photographer Melinda E. Cramer operated the Cramer Photograph Studio along with her husband, but Melinda's true passion seemed to revolve around the cult religion Divine Science. She was a Divine Science writer, teacher, and editor of the cult's journal Harmony. By 1900 Melinda was listed as President of Home College of Divine Science. Mary E. Cooley Harris's career as a traveling photographer took a very bad turn after a pre-packaged batch of pre-sensitized plates failed to develop properly, and most of the portraits she'd taken were invisible. Soon after she abandoned photography and joined the hordes of other women working as a retouchers in the enormous T.C. Marceau photo gallery. Later, she became heavily immersed in the Hermetic Brotherhood, a philosophical cult associated with Madame Blavatsky's Theosophists. In the mid-1870s, Sarah L. Dutcher worked for Carleton E. Watkins as a retoucher and photography sales agent. She was often referred to as the "tall lady," and was quite fetching to men, in particular to Mr. Watkins, who in a letter to his wife Frances (also a photographer), half-heartedly tried to calm her fears: "You are thinking altogether too much about the tall woman, and you are making yourself nervous and fidgety about matters and things you can't help." 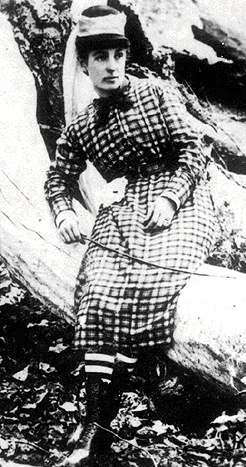 In 1875 Sarah was the first woman known to have successfully climbed Yosemite's Half Dome. Floride Green was an amateur and commercial photographer for over 20 years. She first met her frequent traveling companion, Lillie Hitchcock Coit (who later commissioned the infamous Coit Tower) at their St. Helena high school. Her amateur photography career was uneventful until 1897 when a local newspaper noted: "The many friends of Miss Green will regret to learn of her mishap with the flashlight compound called Blitz-Pulver. This ardent lady amateur was severely burned about the hands by the explosive, but is now well on the way to recovery." At the turn of the century, a new generation of women started experimenting with photography. Women like Laura Adams Armer who later became a major force in Pictorialism and spent months living in Arizona, photographing the Hopi and Navajo on their reservations. She advocated photography as a means for artistic communication and once noted that, "Anyone of ordinary intelligence can manufacture a photograph. So many have discovered this fact that our highways and byways are littered with distorted reflections of nature. The camera has become the symbol of degenerate art." The concept popular among early amateur photographers that a beautiful photograph was a photograph of a beautiful thing, like a sunset or a flower, began to fade. More women turned to photography as an outlet for serious artistic expression and joined up with the Pictorialism and Photo-Secession movements. In 1900, fifty years after Julia Shannon began making daguerreotypes , there were 41 known women photographers and 75 additional women working in San Francisco's photographic industry. "To be a traveling photographer is a new departure even for the new woman, but that is what Miss Mary Winslow has been for the past three years. She intends to follow the business all her life, unless she gets so rich that her time will all be occupied in taking care of her money, and even then she thinks she will have to steal out for a short trip once in a while. She has already amassed $2,500 towards the fortune. The photographic work as she does it is not merely a fad, but, as she herself expresses it, is for 'pecuniary pleasure' with duplicates always in order."